In today’s world, physical appearance and the desire to look young are very important. Skin and hair play a powerful role in this as they impart much information, not only about our race, ethnicity, and health but also about gender and age. We experience a significant change in pigmentation during our journey of life from birth to puberty and then to young adulthood, middle age, and beyond. Graying of hair is a conspicuous sign of aging. It is said that 50% of the people have 50% gray hair by the age of 50. Premature graying or premature canities is defined as graying that occurs before the age of 20 in Caucasians, before 25 in Asians, and before 30 in Africans. The pathogenesis of premature canities is not yet clear but various hypotheses have been suggested including alteration in pH and cysteine levels in melanosomes, the role of trace metal ions, vitamin B12 and folic acid, vitamin D3, and oxidative stress. Along with increased awareness, there is an increased demand for treatment modalities but the options are limited and unsatisfactory. Various topical preparations containing phytic acid, amino acids, peptides, acetyl hexapeptide-1, melitane, capixyl, pea proteins, etc. are already available in the market. Currently, research is focusing on topical liposome targeting melanins, genes, and proteins selective to hair follicles for therapeutic and cosmetic modification of hair. Asia is geographically, racially and culturally diverse. This leads to variations in the skin types and pigmentary disorders affecting the Asian skin. 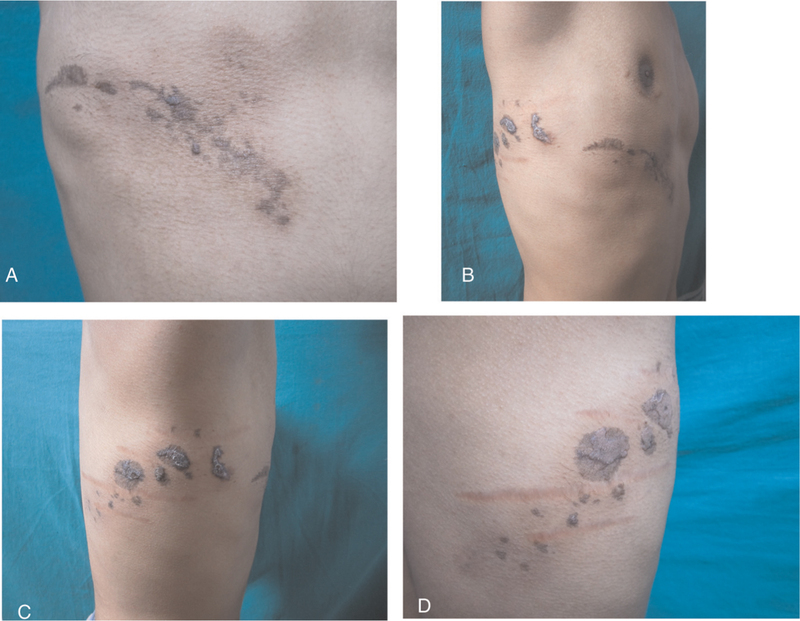 This review briefly outlines the various hypopigmentary disorders affecting the Asian skin. Several of these disorders are idiopathic in origin, whereas some are due to autoimmune mechanisms, infections or secondary to inflammation of the skin. Hypopigmentary disorders often have a significant psychological impact. The treatment of these disorders is diverse and depends on the cause of hypopigmentation. Melanosis is the most common cause of pigmentation of the mucosal areas. Mucosal melanoma is rare; however, at early stages, the differential diagnosis with benign melanosis can be challenging. Here, we provide a brief review of dermoscopy and reflectance confocal microscopy features of melanosis of the genital and oral mucosa. Background: Periorbital hypermelanosis is a condition characterised by bilateral homogenous, hyperchromic macules and patches, primarily involving the upper and the lower eyelids. 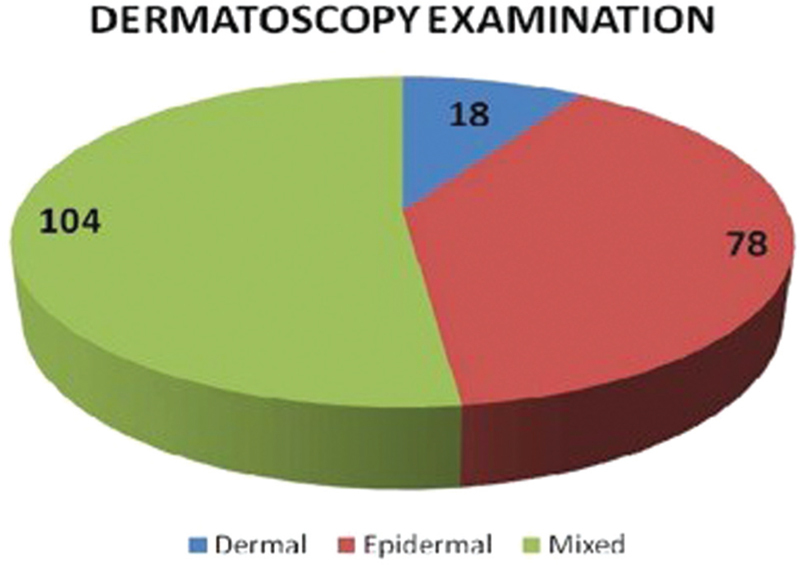 Aim: To study dermoscopic patterns of periorbital hypermelanosis. 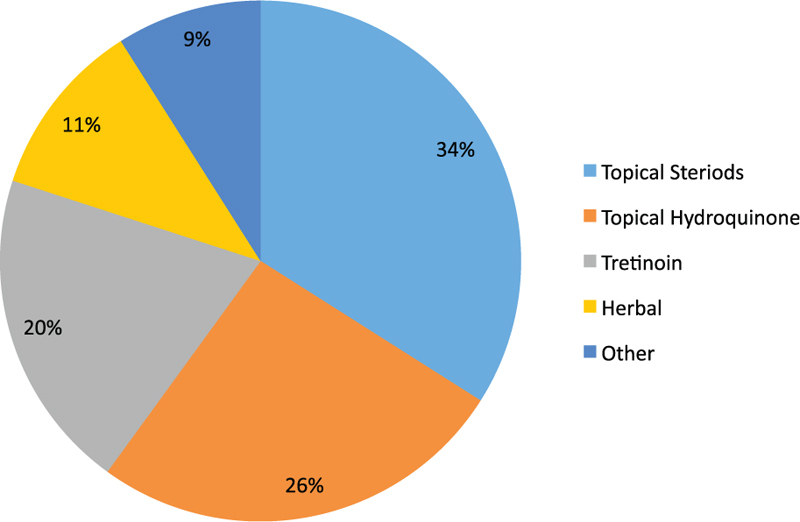 Materials and Methods: The study comprised 200 patients, of age above 18 years, attending the Skin and V.D. Out Patient Department. Detailed history was noted in the proformas, and the dermoscopic finding in view of colour of pigment, pattern of pigment and pattern of blood vessel was noted with a Dermlite-3 model. Result: Out of 200 patients, 78 (39%) had epidermal type of pigmentation, that is, light brown, 18 (9%) had dermal, that is, dark brown to grey and 104 (52%) had mixed type, that is, visible vascularity with epidermal type of pigmentation. Reticular pattern was the only type of vascular pattern which was observed in all mixed type of pigmentation. 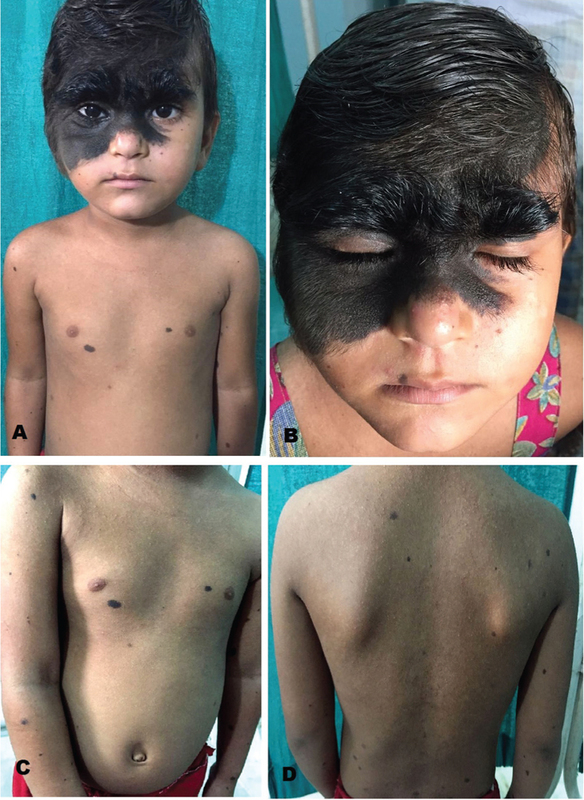 Conclusion: Patients with periorbital hypermelanosis showed brown circles, with colours on dermoscopy from brown to grey based on the level of pigmentation and reticular type of vessel arrangement. Background: Melasma is an acquired chronic hypermelanosis of sun-exposed areas which significantly impacts quality of life. There are few epidemiological studies in medical literature concerning the disease, even less in the Nepalese population. Aims: The present study aimed to investigate the epidemiology of melasma in Nepalese patients and to focus on the clinical manifestations and factors that precipitate this condition. Materials and Methods: A semi-structured questionnaire was administered to melasma patients treated at a dermatology clinic between 2015 and 2016. Melasma was classified on Wood’s light examination, and the patients were thoroughly examined. Various precipitating and etiological factors for melasma were also documented. Results: We assessed 138 patients, of whom 25 (18.1%) were males and 113 (81.9%) were females. Most of the patients 63 (45.7%) reported their melasma of less than 1-year duration. The most commonly reported trigger factors were prolonged, intense sun exposure 113 (83.3%), stress 48 (34.8%), pregnancy 42 (30.4%), contraceptive pills 8 (5.8%) and over the counter steroids use in 6 (4.3%) patients. Housewives and the unemployed constituted 63 (45.7%) of patients followed by service holders and business associated in 22 (15.9%) of patients. Family history was seen in 47 (34.1%), and a history of previous treatment sought was seen in 62 (44.9%) patients. The maximum number of respondents 91 (65.9%) had Fitzpatrick type III followed by type IV in 42 (30.4%) patients, and 5 (3.6%) had type V skin photo type. Preferred facial topographies were malar 125 (90.6%), central facial 46 (33.3%), forehead 40 (29.0%), and mandibular 19 (13.8%). 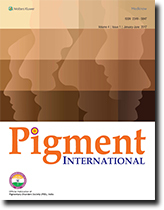 The pigmentation on woods lamp showed epidermal in 90 (65.2%) followed by dermal in 29 (21.0%) and mixed in 19 (13.8%) patients. 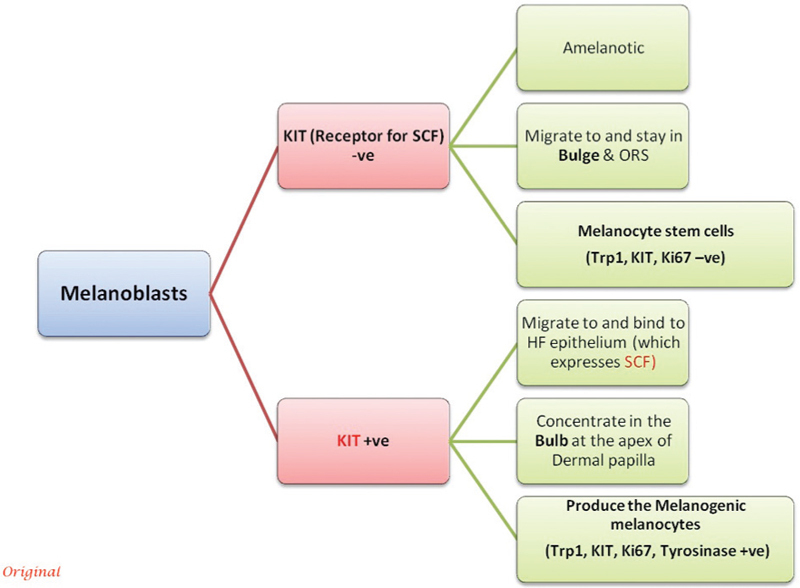 Conclusions: Melasma is more common in females with a strong history of intense sunlight exposure, pregnancy, and stress being the most common provoking factors. A multifactorial etiology has to be sought for in depth for all patients presenting with melasma. 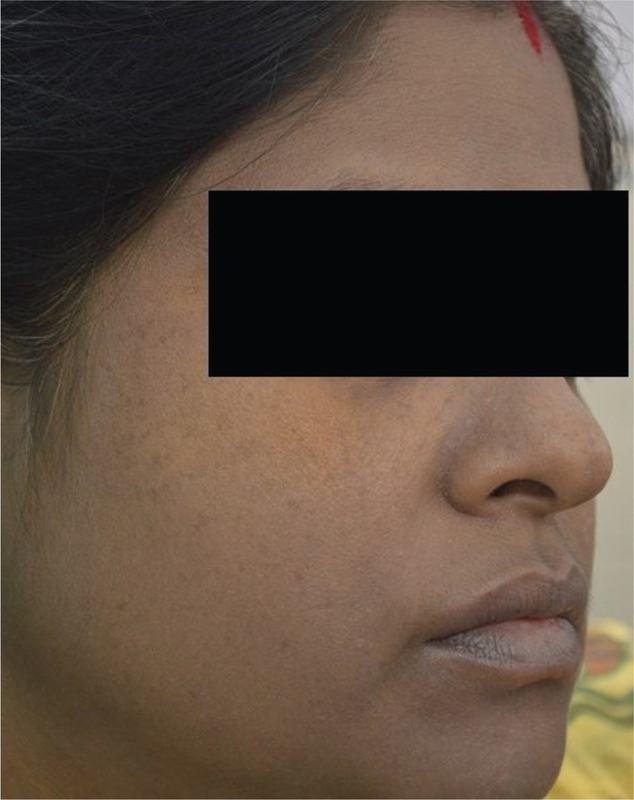 Background: Melasma is the most common cause of facial melanoses in Indian population. It is mostly seen in females of reproductive age group. Since any kind of alteration in skin colour is considered to be abominable and melasma being a difficult-to-treat condition, it is understandable that it adversely affects the psychological and emotional well-being of the patients. Aim: To study the quality of life (QoL) in patients with melasma and its correlation with disease severity. Materials and Methods: A total of 104 melasma patients were enrolled. Severity of melasma was scored on the basis of Modified Melasma Area and Severity Index. QoL was assessed by Dermatology Life Quality Index (DLQI) questionnaire. Results: The overall mean DLQI was 9.92 ± 7.01 with relatively higher value in females than males. Those between the age group 16 and 35 years had higher DLQI compared to the older age group. 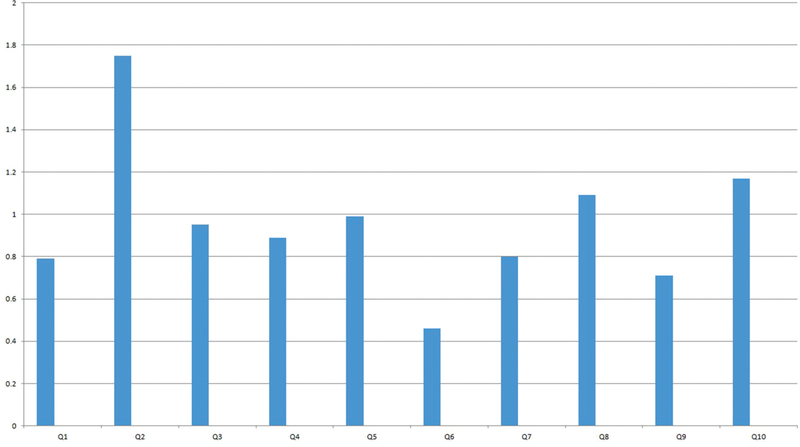 The DLQI significantly increased with the socio-economic status of the patients. Unmarried females had a significantly poorer QoL (13.64 ± 8.2) compared to married females (9.16 ± 7). The DLQI score increased with the severity of melasma, though the results were not statistically significant. Those with shorter duration of disease (<1 year) had greater impact on QoL when compared to those with longer duration. Conclusion: The results show that an asymptomatic, totally benign disease such as melasma has a moderate effect on the QoL of the patients. Moreover, the clinical severity cannot be considered as the sole criteria to decide the impact of melasma on patient’s QoL. Other factors such as socio-economic status and marital status additionally play a significant role. Assessment and treatment of psychological consequences must be considered as an indispensable part of management of melasma patients. 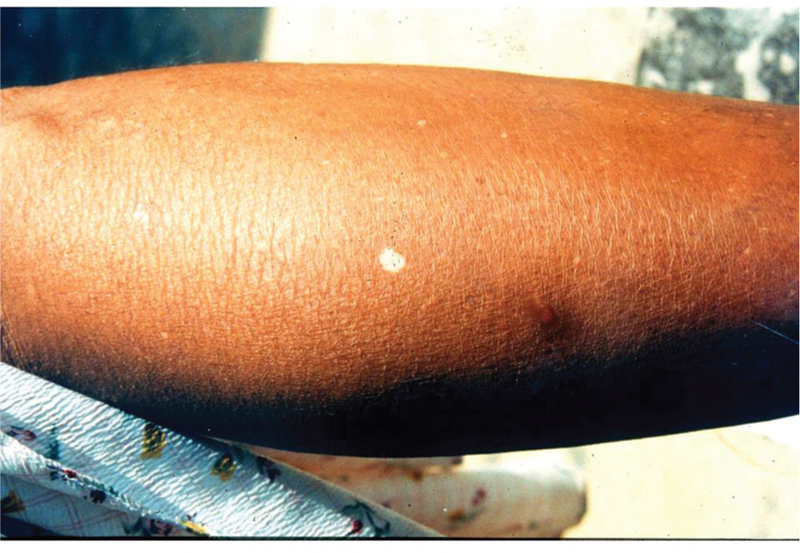 Lichen aureus is a localized variant of pigmented purpuric dermatosis and is rarely reported. 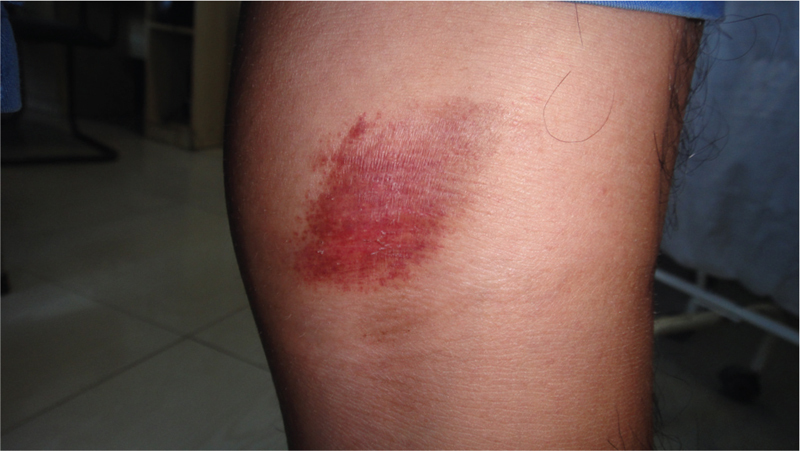 The “deck chair sign” (DCS) defines a peculiar clinical pattern that was initially described in patients with Papuloerythroderma of Ofuji and has been considered the clinical hallmark of this controversial entity. However, DCS has been reported in other cutaneous disorders as well. We report a case of lichen aureus seen in a 22-year-old male patient which showed DCS.